Building/Investing Guidebook 2017 – Designed to help those interested in self-storage investing as well as those who want to establish or expand an operation, this Guidebook addresses real estate, finance, development and construction. 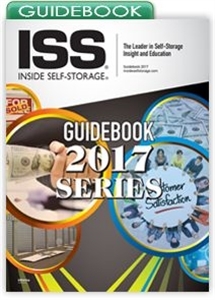 Facility-Operation Guidebook 2017 – Designed for managers and owners, this Guidebook addresses key aspects to self-storage operation, providing insight to revenue, sales, legal issues, marketing, maintenance, liability, technology, security and much more. If you prefer to purchase the Guidebook Series in a digital format, click here.